Mark Joined Millwall FC straight from school, making his professional debut in the Championship at the age of 18 in a 4-1 win against Watford FC. 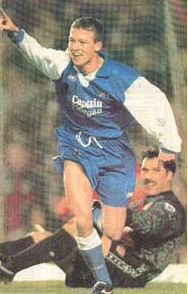 Mark went on to make 32 appearances for the South London club over two seasons (1993/94 and 1994/95) and a further 13 from the bench – scoring 3 goals in the process. The following Season the then Sheffield United manager Dave Bassett signed Mark, who stayed at the Yorkshire club for 3 seasons (1995/1996, 1996/97 and 1997/1998). He made 56 appearances in total during his spell at the club. Mark went on a brief loan to Southend United towards the end of his time with The Blades. Two Permanent spells with Southend United (1998/99, 1999/00 and 2001/02, 2002/03) followed. Mark made 122 appearances for the Shrimpers and a further 22 as a substitute finding the net once during his stay at Roots Hall. The two Spells at Kingstonian were interwoven with his time on the coast (2000/01 and 2003/04). Mark made 63 appearances for the club scoring 6 goals. It was whilst playing for the K’s that he first encountered Stevenage Borough. “During the 2001/01 season, the Kingstonian team coach was caught up in a massive traffic jam on the M25. At about 2.45 we decided to get changed on the coach and warm up. We arrived at Broadhall Way at 2.55, put our boots on and started the game. We were 3-0 up in 15 minutes and ended up winning the game 5-2”. Dean Martin and Nathan Bunce were the scorers for Boro that day. Mark looks back fondly at his time at Stevenage. “I honestly thought we were the best team that season. I arrived after 6 games which Boro had lost nearly every one. If we didn’t have such a bad start, I am sure that we would have gone up. ” (For the record, Boro’s opening 6 games that season resulted in 1 win, 2 draws and 3 defeats). Superstitions (1) Left shin pad before right (2) Skin tight vest under shirt no matter the weather! 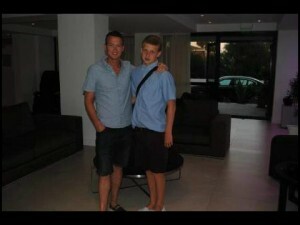 Left – Mark and son Sam, who has recently signed an under 15 contract with Brighton U15’s. Stevenage FC History Website would like to thank Mark for agreeing to the interview and for all the help given in compiling the article. We would also like to wish Mark all the very best for his future footballing career. Wembley photos supplied by Mark Beard and reproduced with his kind permission and that of Matt Ranson the copyright owner.